Crist has been through a lot of adversity during his college career, but the former top high school recruit has one last chance to redeem himself at Kansas. I’m rooting for him to end his career on a high note. Dayne Crist, QB- Weis’ first priority was trying to find a quarterback to run his offense at Kansas, and who better than someone he was already familiar with. That undoubtably was the deciding factor in Crist choosing to transfer to Kansas over other schools, and as a result he will have one last shot to show NFL teams what he can do. I don’t anticipate him ever being a NFL starter, and he might not even stick in the NFL despite his obvious arm talent and NFL size. But for Kansas, having a 6’4”, 235 pound quarterback with a rocket arm is something very new and different, and if he performs well it could really help Weis with recruiting. “I picked Dayne Crist off of Notre Dame’s scrap heap and made him productive, imagine what I could do with you!” Regardless, Crist has a chance to show off one last time for evaluators this year, and I hope he makes the most of it. I’ve never been impressed with his poise in the pocket, he doesn’t seem to be “the guy” in big games or moments, and he looks nervous when he is pressured. 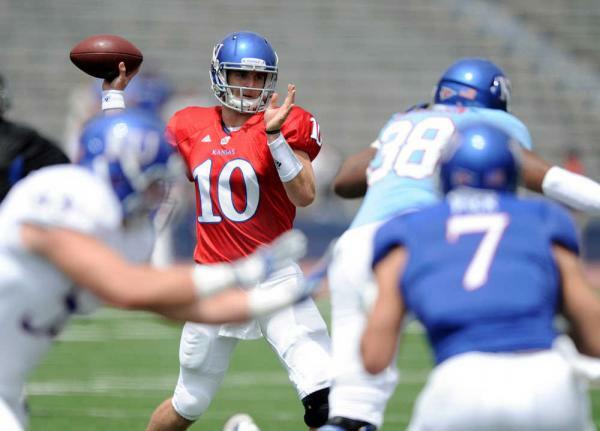 The key for Kansas will be keeping him clean and giving him functional space, and if they can do that while helping him get the ball out of his hands quickly as they did regularly in the Spring Game then he could be successful this season. I really have no idea what to expect from Crist this year, and I don’t think he’s going to get drafted, but it will be fun to see what he and Weis can do together in his last hurrah as a college quarterback. Crist has been through a lot, and I may not love him as a quarterback prospect, but you want to root for him after his injury issues to both knees at Notre Dame before being benched by Brian Kelly in favor of Tommy Rees. Here’s hoping he has a good season and avoids any further injuries. James Sims, RB*- Sims was Kansas’ leading rusher last year with 727 yards and 9 touchdowns (4.0 ypc) and the 6’0” 202 pound back with surprising speed had a firm grip on the starting position until he was arrested for a DUI in April leading Charlie Weiss to suspend him for the first three games of the 2012 season. That may not seem like a huge blow, particularly for something as serious as a DUI, but as far as I can tell that is Sims’ first run-in and Weiss has shown that he will not tolerate that kind of behavior as he dismissed 10 players from the team shortly after being named Head Coach. The Jayhawks have a surprising amount of talent and depth at running back, so Sims will have to fight and produce when he comes back from his suspension to earn his job back. He’s got some potential, but I want to see how he does in the final 9 games (or 10 if they can somehow get to a bowl game), but I’m glad Weis is taking a firm stance on these kinds of issues. That’s a quick and easy way to show your players that you aren’t joking around when it comes to keeping yourself out of trouble- suspend your leading rusher and a sure-fire starter when he slips up off the field. Good for Weis. Tony Pierson, RB**- Pierson is a true sophomore but I really like his upside. He’s a speedster listed at 5’11”, 170 pounds so he could really stand to add some weight to help him hold up as a potential feature back, but on only 71 carries he managed 396 yards and 3 touchdowns as a freshman (5.6 ypc). Brandon Bourbon will be his main competition for the starting job for the first three games, and Bourbon is more of a power back like Sims thanks to his 6’2”, 220 pound size and running style. Look for Pierson and Bourbon to both be mixed in a lot for those first three games, with Bourbon handling short yardage and the Jayhawks trying to get Pierson in space as much as possible. He showed impressive shiftiness as a runner last year and ripped off an 88 yard touchdown run in the Jayhawks’ Spring Game, so look for him to make plays even though he is still young. Patterson is an undersized speedster and should be frequently targeted by Crist this year thanks to his ability to make defenders miss and generate yardage after the catch. Daymond Patterson, WR- Patterson was injured for most of the season last year and chose to take a redshirt so he could come back healthy for one last go-round as a Jayhawks receiver. I’m glad he did, because he is going to be a part of a very intriguing offense this year. They have three returning seniors at receiver in him, Kale Pick and DJ Beshears who have all shown they can produce, they have an intriguing 6’4” target Andrew Turzilli who is just a sophomore, and they have three productive running backs at their disposal. If the offensive line holds up and Crist gets comfortable this could actually be a productive offense. Patterson would play a big role in that, as he had 60 receptions for 487 yards and 2 touchdowns as a junior, his first as a receiver after being converted from corner. He doesn’t have a NFL future at corner, but his unique experience playing corner and his familiarity with tackling will make it easier to play special teams as he fights for a NFL roster spot next year. He’s got pretty reliable hands and the 5’8”, 178 pound receiver has some speed and shiftiness to him. He should be Kansas’ top receiver this year, but he won’t be alone by any means. Kale Pick, WR- I like Pick a lot, and like many players on Kansas he started his career playing a different position. Pick used to be a quarterback, but last year was his first as a receiver and all the 6’2”, 205 pounder did was catch 34 passes for 344 yards and 2 touchdowns. Not bad for your first season at a totally new position, especially in only 7 starts. Pick figures to be Kansas’ #2 target this year behind only Patterson, and his emergence should allow Beshears and Patterson to play in the slot more. I didn’t see much of Pick last year, but he showed me reliable hands, solid route running and some shiftiness with the ball in his hands. He’s not polished yet, but I think he has a chance to stick as a NFL receiver. I am looking forward to watching him this year. DJ Beshears, WR- When I saw Beshears catching a pass in the slot I thought he was a running back split out, I didn’t realize he was a slot receiver. He is listed at 5’9”, 185 but may only be 5’8” and his lower body looks more like Maurice Jones-Drew than any receiver I have ever seen. He’s got some burst and solid hands, and while I don’t think he’s draftable at this point it should be interesting to see what he can do in Weis’ offense. He led the team with 40 receptions for 437 yards and 3 touchdowns last season but with Patterson and Pick emerging I think he will be more of a complementary target this year. Andrew Turzilli, WR**- Turzilli is a sophomore this year and obviously won’t be declaring for the draft, but he presents some very intriguing size and athleticism for Kansas that they haven’t really had in a while. He is listed at 6’4”, 185 pounds and has the size and speed to threaten defenses vertically unlike any other receiver on Kansas’ football team right now. He is behind three senior receivers this year, but that should give him a chance to sneak up on people and create some big plays down the field without getting much attention from defenses. I would be surprised if Weis elected not to use him since he is an intriguing weapon, and a four WR set with Pick and Turzilli on the outside with Patterson and Beshears in the slot sure would be intriguing, and not many defenses in the Big-12 could take that away easily. He’s unproven right now, but I like Turzilli’s upside. Mike Ragone, TE- Ragone is yet another transfer from Notre Dame that Weis used his former coaching job to pull. Ragone is a senior and has plenty of size at 6’4”, 250 pounds. Like Crist, he has struggled with injuries and Notre Dame just keeps churning out top NFL talent at tight end, most recently Kyle Rudolph and now Tyler Eifert has a shot at the 1st round. That all contributed to Ragone following Weis to Kansas, and he figures to be the starter for the Jayhawks this year. He only has 11 career receptions for 109 yards, so he is far from a proven commodity, but part of that is due to his struggles with injuries and the two NFL players he has been stuck behind. He’s an undrafted free agent at this point for obvious reasons, from a lack of production to injury issues, but it will be interesting to see if Ragone can stay healthy and get some targets in this offense. There’s a very real possibility that if he earns the starting job that he could double his career production in just one season, and it would be really cool to see him score his first collegiate touchdown with his last chance at Kansas. Tanner Hawkinson, OT- Tanner Hawkinson is likely Kansas’ top NFL Draft prospect at this point, and he has been a mainstay on the offensive line for the Jayhawks, entering his senior season with a remarkable 36 career starts. He started his first 24 at left tackle before moving to the right side last year, but now he is back at left tackle for his senior season. He’s listed at 6’6”, 295 pounds and he moves well for a man his size, and you can tell that he is a former tight end. I’m not sure he will be able to stick at left tackle, but there is some potential for him to do so. He is athletic and his biggest problem is his lack of lower body strength and ability to anchor in my opinion. If he can get even stronger (to be fair, he has added 70 pounds of weight since arriving at Kansas) in his lower half it would help him anchor better versus bull rushes and generate more push in the run game. Right now he’s a late round prospect, but NFL teams might look at his athleticism and see an unfinished product despite the possibility he will leave Kansas with 48 career starts. Duane Zlatnik, OG- Zlatnik is probably the second best offensive lineman after Hawkinson, but while I am hoping Hawkinson can get stronger that isn’t a problem with Zlatnik. He is listed at 6’4”, 311 pounds and is considered to be the strongest player on the team. I’m not that familiar with him from a technique standpoint, but now that I have uncovered all of this talent on Kansas’ football team I will likely be watching much more of them this season. He enters the year with 21 career starts, 20 of them coming at right guard, but he will be at left guard next to Hawkinson this season. Opurum is a former running back (and a pretty good one at that) but his athleticism is on full display at defensive end. I think he has a chance to get 8 sacks this season, he’s got upside as a pass rusher. Toben Opurum, DE- Opurum is a captain and I listened to an interview he did during the spring and I was impressed with what he had to say. He’s a hard worker, a leader, a team captain and seems like a nice kid. 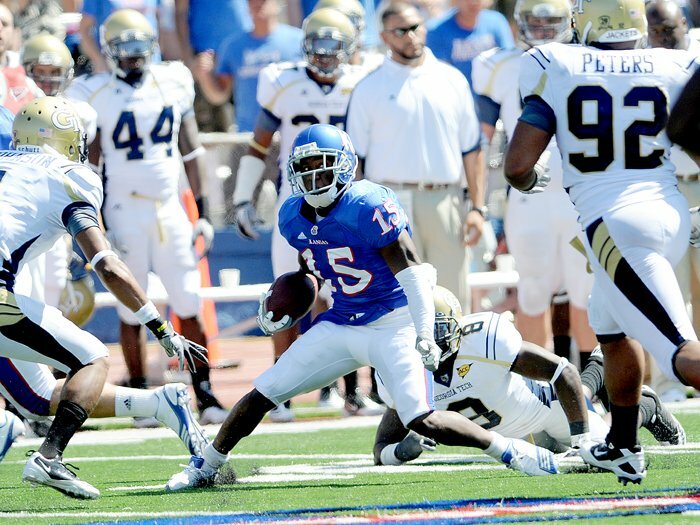 Like so many Jayhawks, he started at another position and for Opurum it was running back. He moved to defensive end, bulked up and after transitioning to DE as a sophomore he produced 45 tackles, 6.5 TFL, 4 sacks, one forced fumble, and a pass break-up as a junior. He’s Kansas’ top returning pass rusher, and was also credited with 7 QB hurries (I don’t like to list those because they are so subjective and usually poorly recorded). 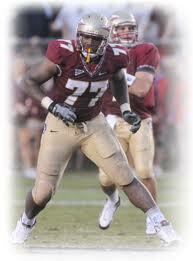 Opurum is listed at 6’2”, 245 pounds and likely won’t be a 4-3 DE at that size. It’s tough to make it as a 4-3 DE when you’re 6’2” or under, and few are productive if they get the chance. Opurum’s best bet is probably as a 3-4 OLB where his size wouldn’t be as problematic and his athleticism may be better utilized. Opurum has impressive burst and speed, and while he is new to the position I think he has a shot to double his TFL and sack production from last season. I think he has 10+ TFL and 8 sacks in him, I really do. I like Opurum and I’m really rooting for him to have a great season and get drafted, and I hope to see him at the East-West Shrine Game this year. Darius Willis, MLB*- Willis is a junior middle linebacker who has NFL size at 6’2”, 243 pounds and is the team’s 2nd leading tackler who is returning this year. He had 81 tackles, 7 TFL and 1 sack last season, his first with the Jayhawks after transferring from Buffalo and sitting out the 2010 season. He has 14 career starts including his two starts as a freshman at Buffalo, and still has two years of eligibility remaining. The Jayhawks are amassing some talent along the defensive line, so it will be interesting to see how Willis builds on his impressive sophomore season. I particularly want to see how he does in coverage. Tunde Bakare, OLB/SS- Bakare is a hybrid player that I’m not super familiar with, but I do know that in 7 starts last year the 5’10”, 205 pounder amassed 51 tackles, 1 TFL and 1 pass break-up. The most impressive thing about Bakare is that, according to Phil Steele’s College Football Preview, he has 4.35 speed. That’s blistering, and while he’s not much of a NFL prospect at this point that sure would get the attention of NFL teams and it could help him get a roster spot as an undrafted free agent if he shows up on special teams. 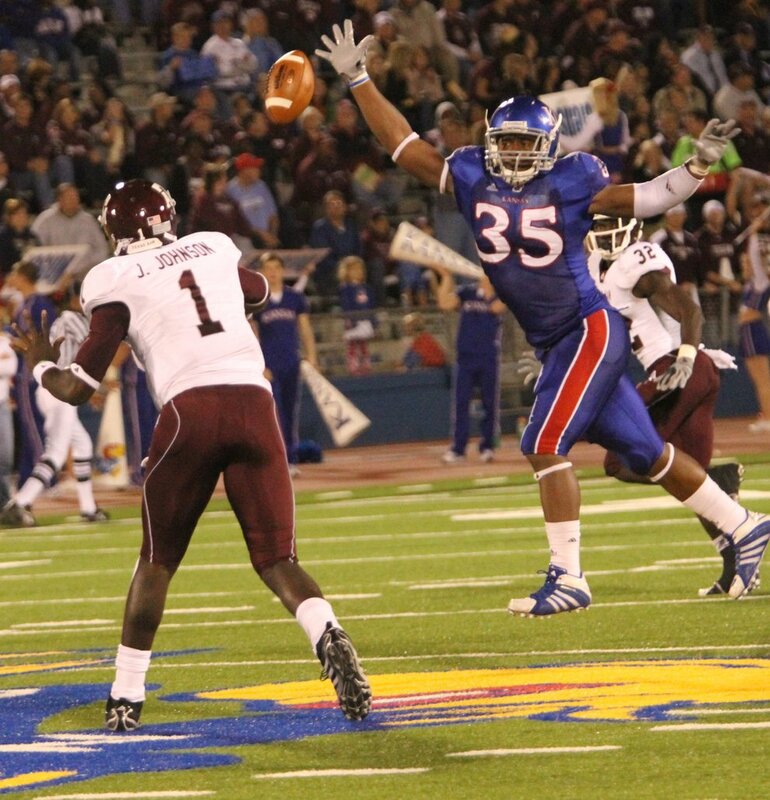 Tyler Patmon, CB*- Patmon is Kansas’ top corner in my opinion, and the junior is listed at 5’11”, 180 pounds. As a freshman he started 9 games and had 45 tackles, 4.5 TFL, 1 sack, 10 pass deflections, 2 interceptions, and a fumble recovery returned for a touchdown. He followed that up with 7 starts as a sophomore, producing 43 tackles, 2 TFL, four pass deflections and another interception. I haven’t seen him play much so I am interested to see if he can continue his playmaking ways as a junior. Greg Brown, CB- Brown is another solid corner standing at 5’11”, 185 pounds. He had 6 passes defended as a sophomore and had 43 tackles, 1.5 TFL, 3 pass deflections and 2 interceptions as a junior. I haven’t seen him play much either, so I want to see if he’s draftable. At this point I don’t have him graded as much more than an undrafted free agent, but a good season this year could help change that. Bradley McDougald, FS- McDougald is the Jayhawks’ leading returning tackler, producing 89 tackles (68 solo), 4 TFL, 1 sack, 5 pass break-ups, 2 interceptions and a forced fumble as a junior last season. He is another position convert, previously playing wide receiver before transitioning to strong safety during the season as a sophomore and starting 2 games. He started all 12 games last year and even returned 2 punts for an average of 11 per return. The 6’2”, 214 pounder has a unique skill set thanks to his ability to contribute as a receiver early on in his career (he has 52 career receptions for 558 yards and 1 touchdown, so he can catch) and he is a reliable tackler and has shown the ability to make plays in coverage. He’s underrated, and I really think he has a chance to get drafted. If Kansas’ front 7 can improve their back end could make some plays this year, headlined by McDougald. Here are my predictions for the upcoming bowl games. My final installment will have the last handful of games to make sure that this post isn’t unbearably long to read. Enjoy the bowl games! I know I will. Why: Clemson has the better, more efficient quarterback (though not by a huge margin) in Kyle Parker plus they have a very nice tandem of running backs with Jamie Harper and Andre Ellington. Clemson’s offense is better and I don’t trust B.J. Daniels to not turn the ball over like he has been prone to do. Key to the game: Clemson’s running game. If they can work the clock, have some methodical drives and maybe rip off a couple of big runs they should win the game. Why: Though I often focus on offenses I think the difference in this game will be Miami’s defense. They have a lot of talent on their defensive unit and they have enough talent on their front four to put pressure on freshman QB Tommy Rees of Notre Dame which could force some turnovers. Key to the game: Miami’s defense. If Miami can fluster Notre Dame’s freshman QB and create turnovers then Miami will have a significant advantage. But if Miami lets him get into a rhythm and gives up big plays then Notre Dame will have a good chance. Why: I think Georgia is the better overall team despite their record. They started very slow but once they got A.J. Green back they have been much better. They started 1-4 without him and finished the season 5-2 including an overtime loss to Florida and a loss to #1 overall Auburn. They have been tested against quality teams and I think Mark Richt will have them ready to play. Key to the game: Aaron Murray, QB, Georgia. He’s a redshirt freshman but he has played very well this year, especially since he got A.J. Green back in the fold. Green had nine touchdowns in only seven games this year. If he keeps playing well then Georgia has a great chance to win this game. Why: South Carolina has a good passing game led by Stephen Garcia featuring one of the best receivers in the country in Alshon Jeffrey and Tori Gurley. Both of them are big, physical receivers who create mismatches for even the most physical defenses. In addition they have a stud true freshman running back in Marcus Lattimore who is one of the best running backs in the country even though he is only a year removed from high school. Their offense has a lot of talent, and their defense can rush the passer and create turnovers. Key to the game: Christian Ponder, QB, Florida State. If Christian Ponder plays at all he could give the Seminoles a lift, and if he plays and plays well like he has in the past then he could give the Seminoles a chance at victory. He has a lot of talent on his offense, and they have the ability to be very explosive, but his elbow injury has hindered him. It will be interesting to see if he plays and if he plays well. Why: Northwestern would have a good chance at winning their first bowl game since 1949 if they had Dan Persa playing at QB, but unfortunately he won’t be available due to his Achilles injury that he suffered during the regular season. That makes me think that Texas Tech should be able to beat them with a very good passing offense and a somewhat underrated rushing attack. Key to the game: Northwestern’s defense. If Northwestern can slow down Texas Tech’s offense then they stand a chance to win. They will need to create some turnovers and get some short fields for their offense so they can overcome the loss of Persa. Why: In a game with two decent offenses I think the defense that plays best will lead their team to victory. Whichever unit can force turnovers and slow down the opposing offense will give their offense a huge boost. Florida’s offense isn’t very explosive with John Brantley under center and they don’t have a very consistent running game either. Penn State looked better with Matt McGloin under center, and have a consistent running game led by Evan Royster, but Florida has a good enough defense to stop their offense in my opinion. In a game of defenses I give Florida the edge. Plus I think they have the speed and playmaking ability to change a game on special teams if they get a chance. Key to the game: Florida’s defensive line. If the Gators can get pressure on McGloin without blitzing and if they can slow down Royster with good gap responsibility then Penn State will be in trouble. Why: As much as I might like to pick Michigan State I think Alabama is far too talented to not pick here. Michigan State will be without one of their better receivers in B.J. Cunningham and they have a tough enough task trying to beat Alabama without that. Alabama’s offense should be able to move the ball effectively on Michigan State’s defense and Alabama should be able to rattle Kirk Cousins and probably force a couple of turnovers. Key to the game: Kirk Cousins, QB, Michigan State. If Cousins plays one of the better games of his career Michigan State could win this game. But if Alabama pressures him and he makes mistakes and mental errors then they could be in for a long day. Michigan State has a balanced offense, so it’s not all on Cousins’ shoulders, but if the run game isn’t there then Cousins has to step up big. Why: I think Mississippi State has the team speed to slow down Denard Robinson and if they can bottle him up then Michigan’s offense will sputter. Mississippi State has a very good running game as well so being able to control the clock and keep Robinson off the field will be important. Key to the game: Denard Robinson, QB, Michigan. He is the best player in this game and if he plays well both as a runner and especially as a passer to keep Mississippi State from stacking the box then Michigan could very well win this game. But if he plays poorly, doesn’t make big plays and turns the ball over then Michigan has very little chance. Why: First and foremost I think TCU is overrated. I’ve been pretty outspoken about my opinion of teams like Boise State, Utah and TCU, and the way they have played recently hasn’t changed my mind. I don’t think TCU will be able to stop Wisconsin’s dominant running game. They have three quality running backs in John Clay, Montee Ball and James White, the exciting freshman who actually led their team in rushing yards. Wisconsin has a dominant offensive line, and their quarterback Scott Tolzien rarely makes mental errors that lead to interceptions. Wisconsin has been tested by many good teams this year, but TCU has barely played anybody as usual. Andy Dalton is a good QB, and they have a good offense, but I think that Wisconsin has the potential to get some pressure on him and slow down their run game. Key to the game: TCU’s run defense. If they step up and slow down Wisconsin’s rushing attack and force them into 3rd and longs then it will test Tolzien’s ability to convert on downfield throws. He has shown that he can do that this year, but if you go into a game against Wisconsin you would rather slow down their running game and make Tolzien beat you than get beat up on the ground. Why: This game doesn’t seem like a very even match-up, and that makes me wary of it. Oklahoma is the better team in my opinion, but Oklahoma has struggled mightily in BCS bowls as of late and a hungry team like Connecticut could very well pose them a threat. However, Oklahoma has a very dynamic offense led by Landry Jones, DeMarco Murray and Ryan Broyles plus a very impressive defense that has made a lot of talented offenses look average. So as much as I don’t trust Oklahoma in big games I am trusting that Stoops has finally righted the ship this year. Eventually they will break this streak right? Key to the game: Jordan Todman, RB, Connecticut. If Toddman can get going somehow and break some big runs to take pressure off of UCONN’s passing game then the Huskies will have a chance. But if Oklahoma stacks the box to take Todman away I am afraid UCONN could really struggle. Why: First off I have to say I am very excited to see how this game plays out. I honestly think this could go either way. It’s natural to give the advantage to the better quarterback, which in my opinion would be Andrew Luck, but Tyrod Taylor has been fantastic this year as a passer and as a runner. More than that, he has been extremely efficient. And Taylor is no stranger to late game heroics, watch the Nebraska-Virginia Tech game from last season if you need evidence of that. So it’s hard to say that Luck would have an advantage if it came down to a key fourth quarter drive. Both teams are balanced, they run the ball effectively, they have good defenses… they are just very evenly matched in my opinion. But Virginia Tech has the more athletic defense, the better secondary and I think they will be better on special teams which is why I have to give them the edge. Key to the game: The quarterback battle. Whoever outplays the other should give their team a significant advantage. If Luck can find a way to carve up Virginia Tech’s defense, which few teams have done this year without turning the ball over, then he could win the game for Stanford. But if Stanford can’t stop Taylor from making big plays outside of the pocket, especially on broken passing plays, then Virginia Tech could easily win. I just have no idea which way it’s going to go. Hopefully that wasn’t too long to read. I can’t wait to watch this next batch of bowl games. What better way to ring in the new year than watching football for the majority of the day? I can’t think of one. Thanks for reading!